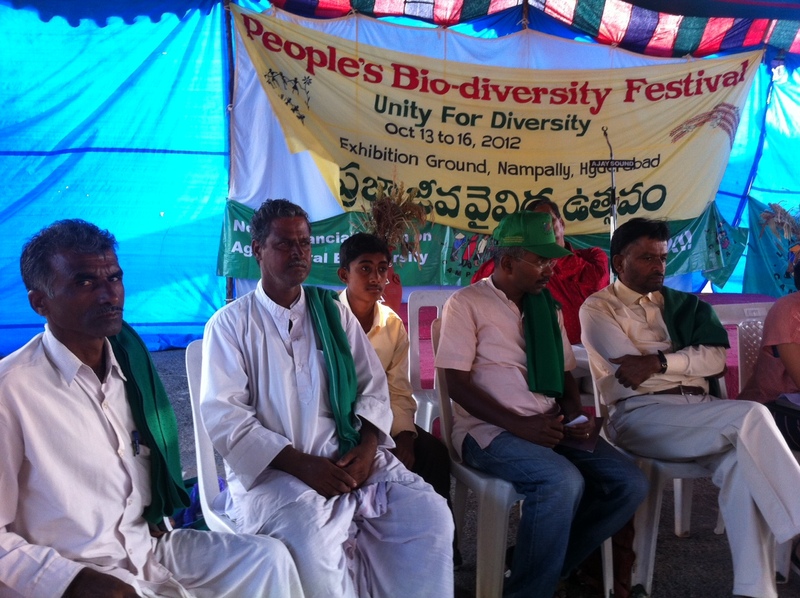 Farmers movements, members of the global peasants movement la Via Campesina organized a talk on “the commercialization of biodiversity” at the Peoples Biodiversity Festival organized by various peoples organizations in Hyderabad in the backdrop of the ongoing CBD negotiations. The participants were members of the karnatas farmers movement- KRRS as well as mr Pablo Solon, executive director of advocacy NGO focus on the global south, Isis Alvarez from Colombia representing Global Forest Coalition. Mr KC KC Basavraj of KRRS highlighted the importance of a strong farmers movement to resist the onslaught of commercial grab of peoples resources like seeds, water and land. Rechanna, a rice seed saver from HD Kote Karnataka who has been saving various seed varieties on his farm described the efforts of the farmers movement KRRS in building a parallel education system for farmers. Krrs has been building a farmers school in the Chamrajnagar District where various model farms have already been constructed by farmer trainers and training on seed saving will be provided and seed banks built. “The people need to keep our biodiversity in our own hands, we must train our next generation how to use and conserve our seed varieties, this is vital for our sovereignty and health of nature“. Mr Ntanjappa Nimbegowda of Haveri district spoke about his efforts to resist the onslaught of bt cotton. Although most local cotton varieties have been wiped out because of bt cotton in India, Mr Nimbegowda has conserved 42 local cotton varieties on his farm. Participants also opposed the emerging threats like synthetic biology which are novel life created by a computer. This is the first time in human nature that humans can create life in a lab for their use, and the release of these new life forms could lead to genetic contamination, invasive alien species and unpredictable and irreversible risks. No laws currently exist to govern this growing industry and LVC has demanded a ban on synthetic biology. Finally, the representative from Colombia stressed about the impacts of sugar cane plantation expansion for agrofuel production on natural resources, and especially on women and workers who work close to slavery conditions. *In the context of the Convention on Biological Diveristy in Hyderabad, India, La Via Campesina will organize a side event in Hall 1 ground level on: “Peasant Seed and Agroecology in Practice”. Speaker will be Keisi Baswaraj leader of KRRS (via campesina, India) and Rechanal agroecological farmer from Karnataka, Kannaiyan Subramainam from Tamil Nadu and Silvia Ribeiro from ETC Groups. We kindly invite all of you to participate in this side even at 18.15-19.45. This entry was posted in Agrofuels, Blog, CBD COPs by globalforest. Bookmark the permalink.